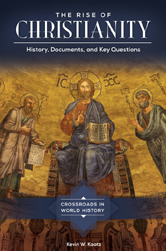 The breadth of materials in this resource enables readers to learn about early Christianity from a number of different viewpoints and to come to their own conclusions about how historical events unfolded in early Christianity. This work focuses on the first four centuries of early Christianity, including topics on Jerusalem, Herod the Great, Paul, Tertullian, Mani, The Arians, Constantine the Great, and many others. Question 1: Why Were Christians Persecuted? Question 2: How Did Christianity Spread? Question 3: Why Was Christianity Popular?